And Marius, Jovane Cabral 74 rated etc. no upgrade to Joao Felix is actually a joke he has the same goals as Marega btw and half of the minutes... same with Pizzi most assists in the league by far no upgrade..
Yup, so many upgrades not put through. Instead of releasing all the H2H upgrades, they just only did the big players and some of the ROTW. Makes no sense. What’s the point with Gedson and Diogo Leite? Haven’t seen one on the market.. are they even available?? Ruben Dias was lucky he didn’t get the yellow on his first tackle against Marega..
terrible ref, as usual, terrible pitch as well. Good game, still a long way to the finish line..
Ref was terrible indeed. Pepe again showed why he is an a**hole. Porto’s goal was offside for me. 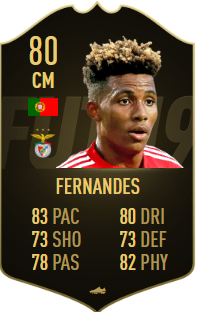 But also that push from Samaris in the pen area against Brahimi was way too risky..
Just want them to release the Eusebio sbc already..
btw exactly the performance I expected from Benfica yesterday. Too much rotation atm, also it’s nice if it’s working.whats up with Seferovic? Didn’t watch the game was in clsss. Apparently it was Lage’s worst game yet. Felix and Seferovic need to rest, apparently Seferovic got injured yesterday, hopefully nothing big since he plays a big role in the team, and we have no other striker (Jonas isn’t 100%) .Lage also keeps putting midfield players in the wings, pizzi works since he was a rm before, but players like Gedson and Krovinovic won’t work. Mehhh, not like Carnaval is huge in the whole country, unlike in the U.S. where one city celebrates mardi gras..
that team is really meh. Sometimes I think while watching at new promo teams I’m just seeing the same teams all over the promos again and again just with different card styles.. If there's a Prime Moments Eusebio SBC i'm gutting my club for it.